After our stay at the West Baden Springs Hotel, we journeyed further into Indiana, staying with friends just outside of Indianapolis. 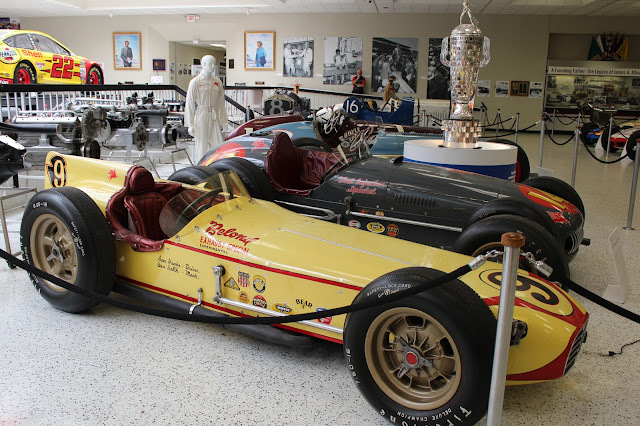 We were in the state for Bloomington Gold, a major annual Corvette event that had previously been held in Bloomington but has now relocated to the Indianapolis Speedway. It is a three day event and we would be present for two of those. 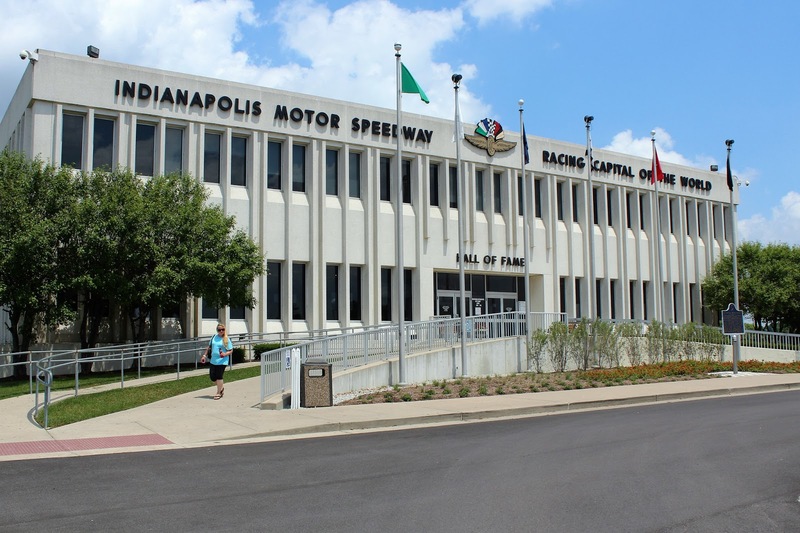 Although we began with Corvette things on the first day (and these will be covered in other posts), a short walk brought us to the Indianapolis Motor Speedway Museum, where we spent several happy hours. 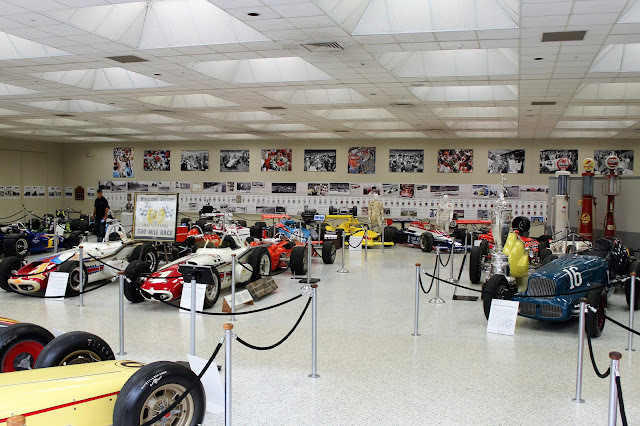 The museum opened in 1956 and has been in its current building since 1976. 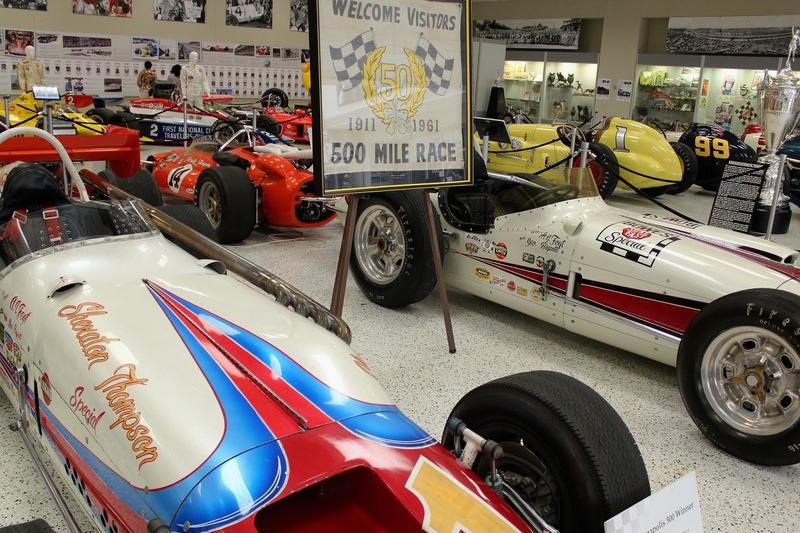 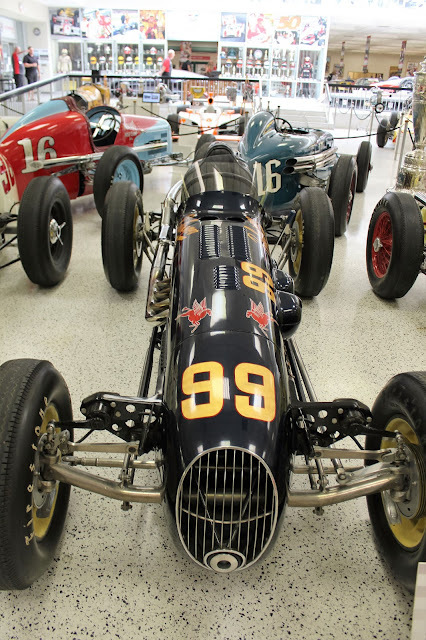 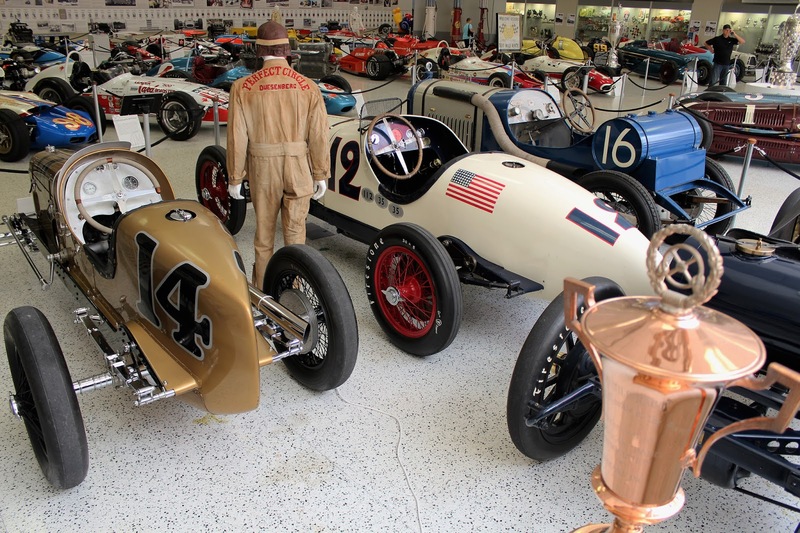 While focused on the Indianapolis 500 and Brickyard 400 races, it does include the Auto Racing Hall of Fame and exhibits connected to motorsports generally. 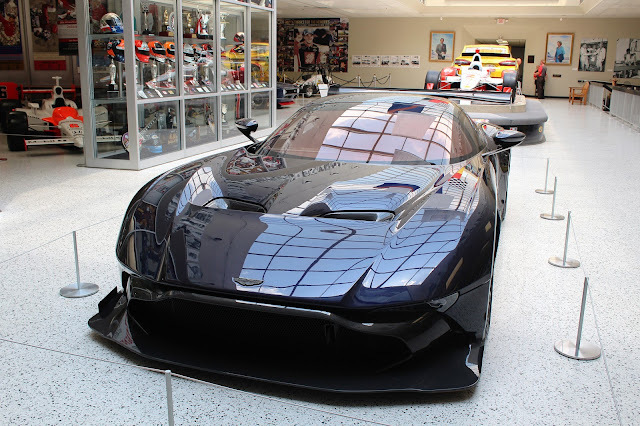 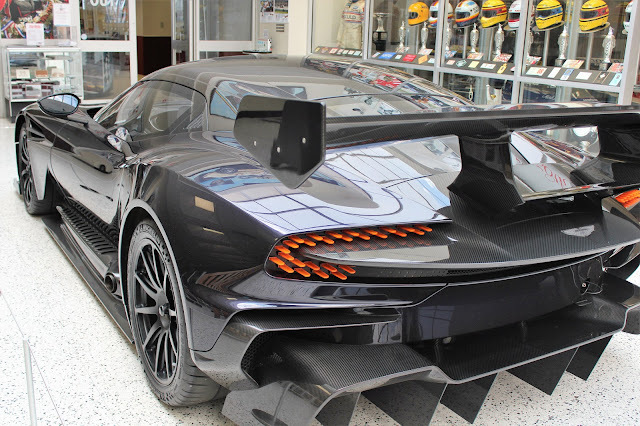 And in the main lobby as we walked in was an Aston Martin Vulcan, one of three (from a production run of 24) in the United States. This 800 hp track-only car subsequently came up for auction after we visited but bidding failed to meet the US$2.3 million minimum estimate. 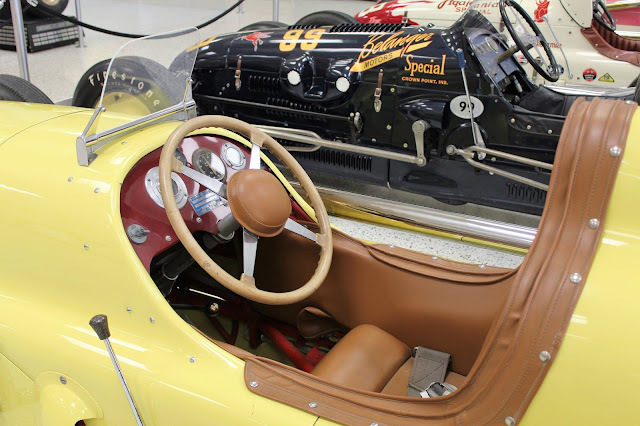 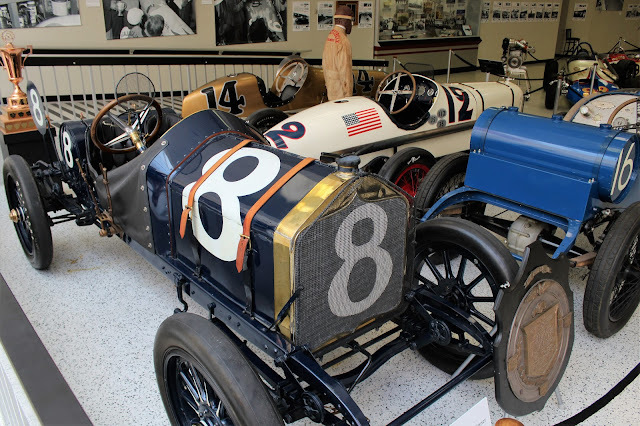 Of course, the highlight of this excellent collection has to be the winning car of the first Indianapolis 500 race, a 1911 Marmon Wasp, which has gone done in history as the first car to have a rear-view mirror. 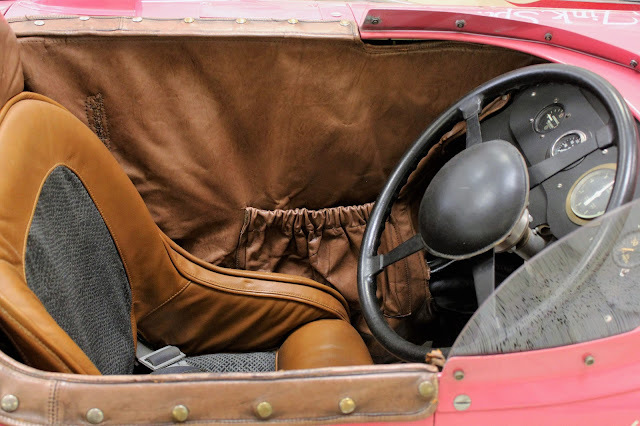 This meant that there was no need for the usual riding mechanic to keep a lookout for traffic. 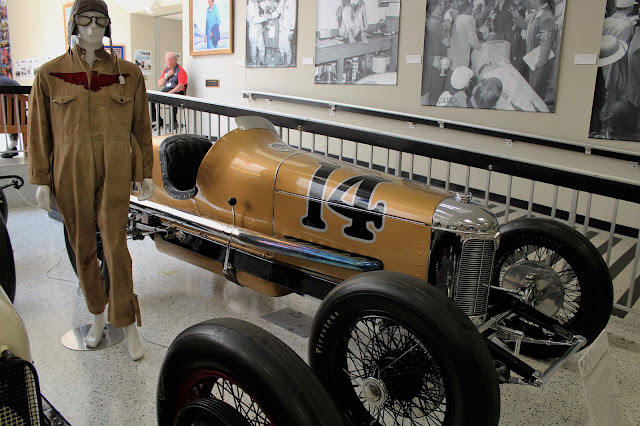 The driver was Ray Harroun, who had come out of retirement to race the car, and then immediately re-retired. 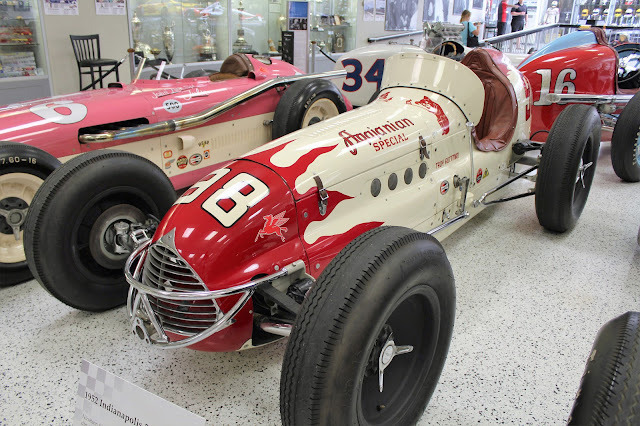 There were 40 cars in the race and Harroun won at an average speed of 74 mph. 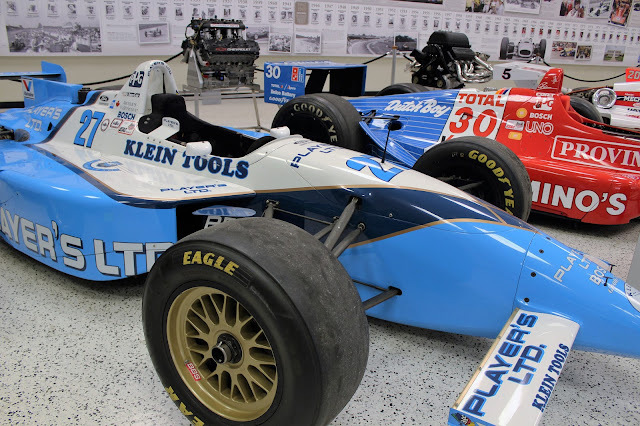 As one can see by the video below racing was pretty chaotic in those days. 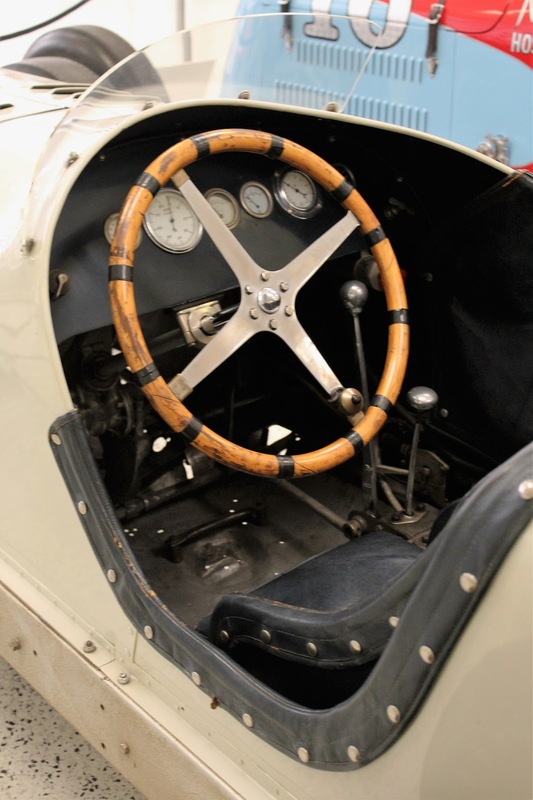 The early racing cars were really distinctive and the museum boasts an impressive number of survivors from those days. 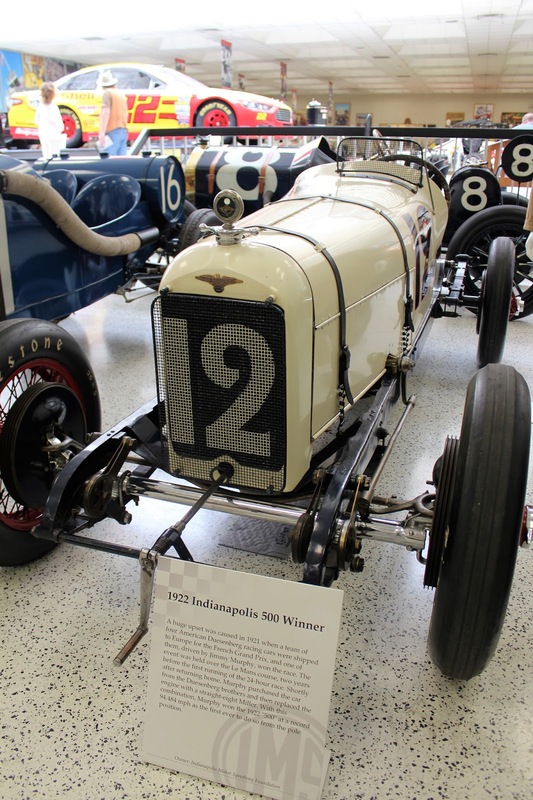 The second Indy 500 was won in 1912 by Joe Dawson, accompanied by a now-mandatory riding mechanic (Harry Martin, in this case) at an average speed of 78 mph. The prize for first place was $20,000. 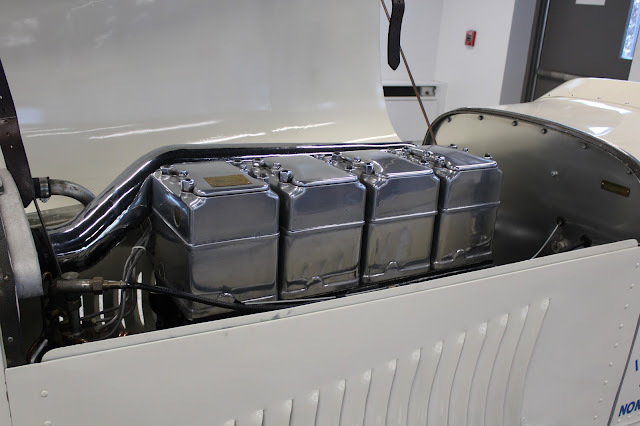 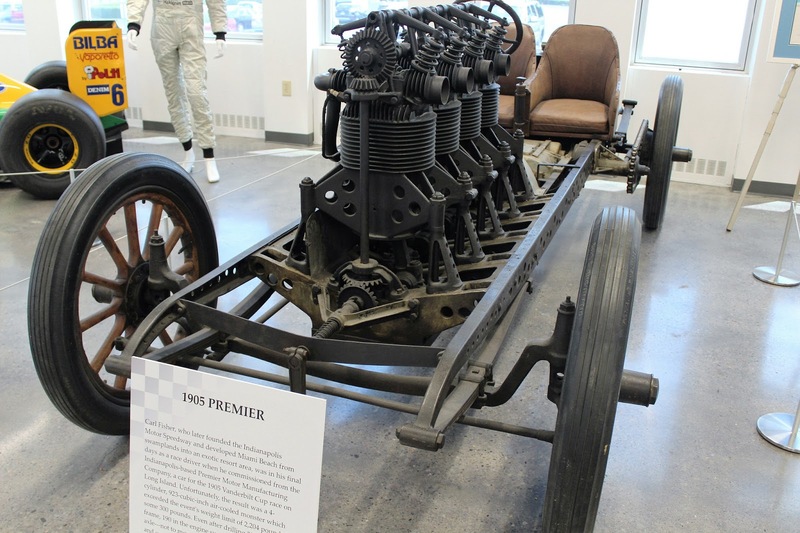 The winning National car was powered by a huge 8 litre four cylinder engine. 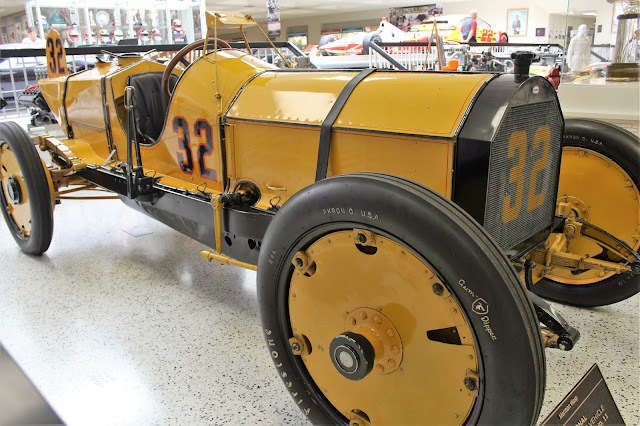 The huge purse--the biggest in motorsports--brought interest from France and in 1913 the race was won by Rene Groux in a Peugeot. 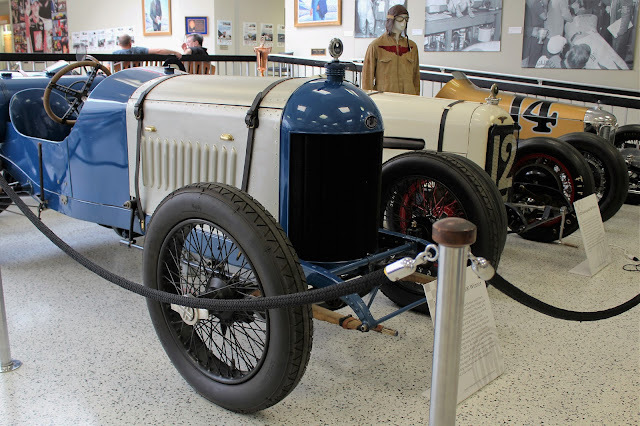 The next year saw a Delage win, followed by three other French cars. Interestingly, the rules in 1914 had been changed so that any alcohol was forbidden. 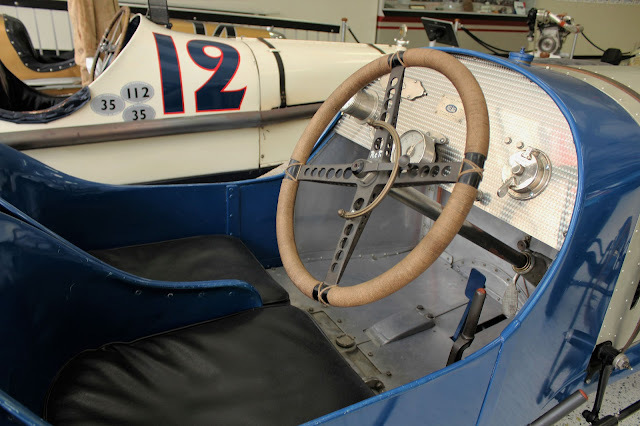 Apparently M. Groux had enjoyed champagne during his pitstops the year before! In 1973 Rene Thomas, then aged 87, returned to the Speedway and was reunited with the Delage. 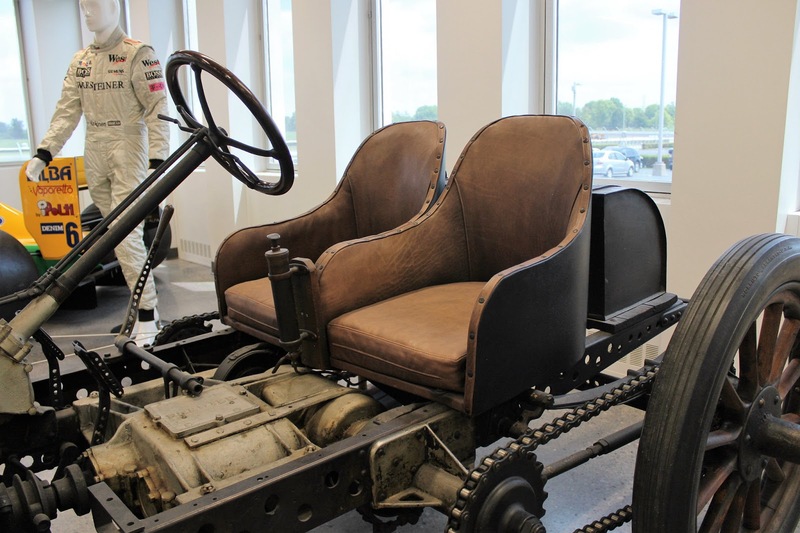 It was driven around the track and he occupied the riding mechanic's spot. Another French car, a Peugeot, was driven by a British driver in 1916 to victory but the race was then suspended for two years due to World War 1. 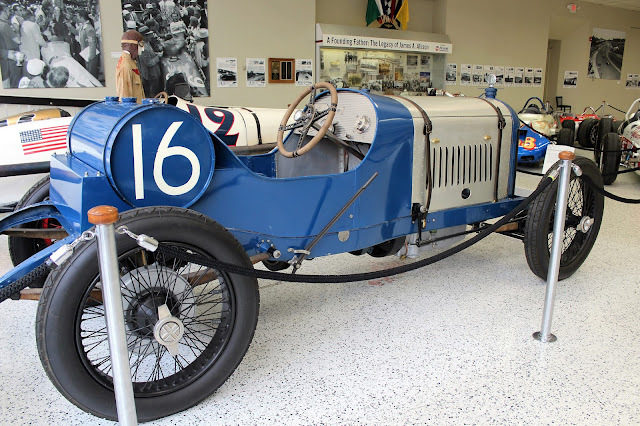 Jimmy Murphy, winner of the 1921 French Grand Prix, came to Indianapolis in 1922 with his Duesenberg-Miller, and won the race, the first driver to do so from the pole position, at an average speed of 94.5 mph. 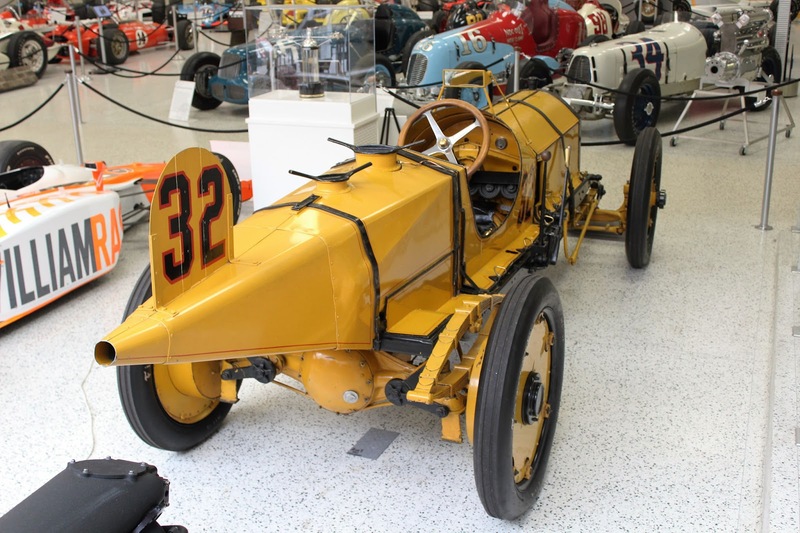 The car was the same one used for the Grand Prix win but modified for the Speedway circuit. 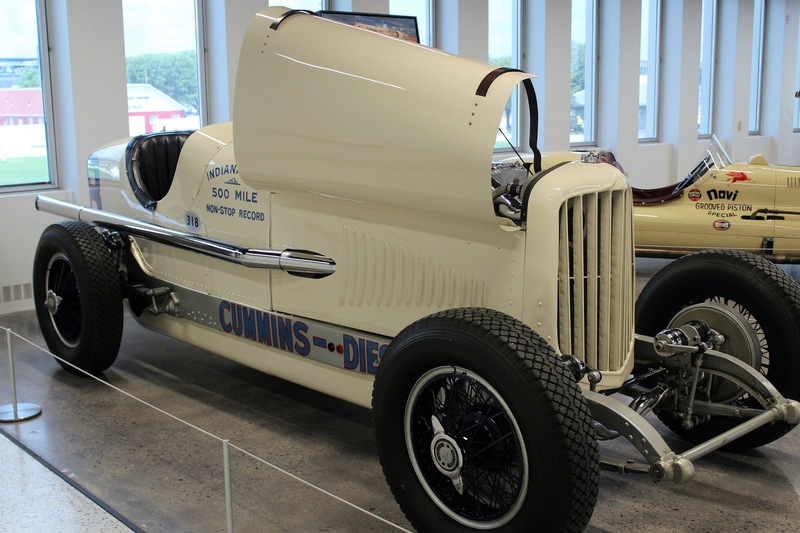 A sister Duesenberg is at the Simeone Foundation in Philadelphia and a third car has recently resurfaced and is being restored. The winning car from 1928, which had placed third the year before, was one of my favourites in the musuem. 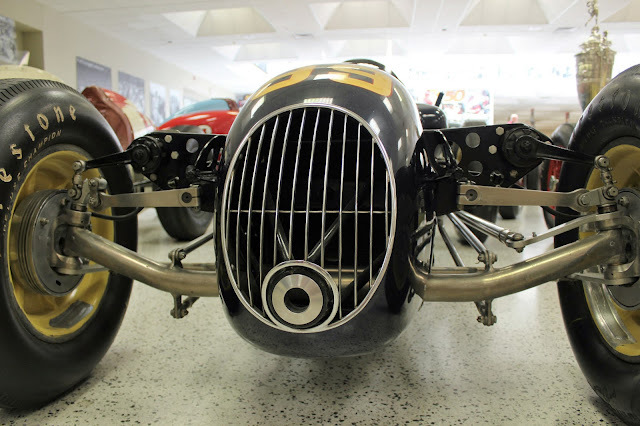 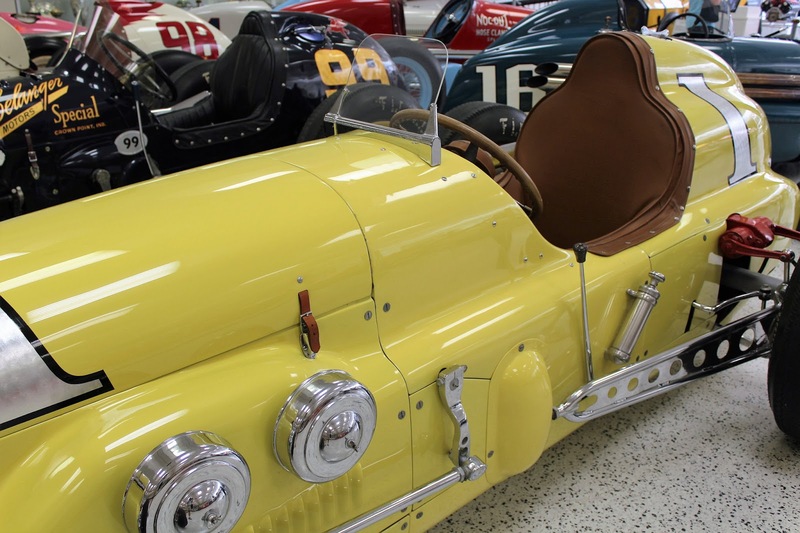 This rear-wheel drive Miller Special is a beautifully-constructed car. 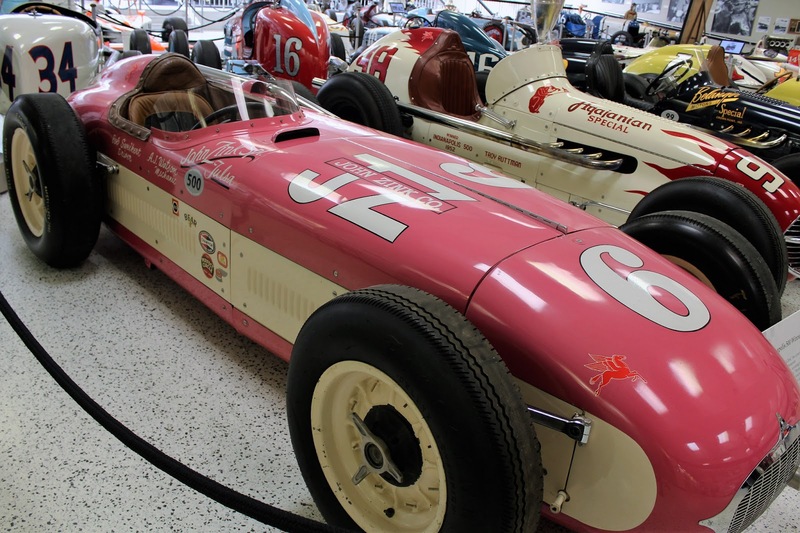 Rookie driver Louis Meyer was enlisted to drive it less than a week before the race and drove a careful and considered Indy 500, the first of his three victories. 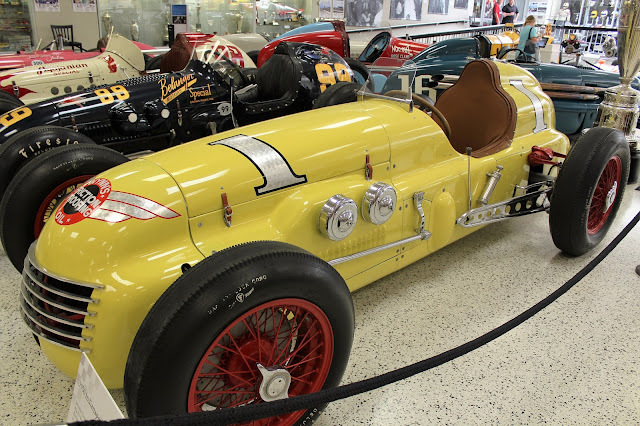 The 1930s through 1950s saw a lot of the classic front-engined "roadsters" that are the classic American racing car. 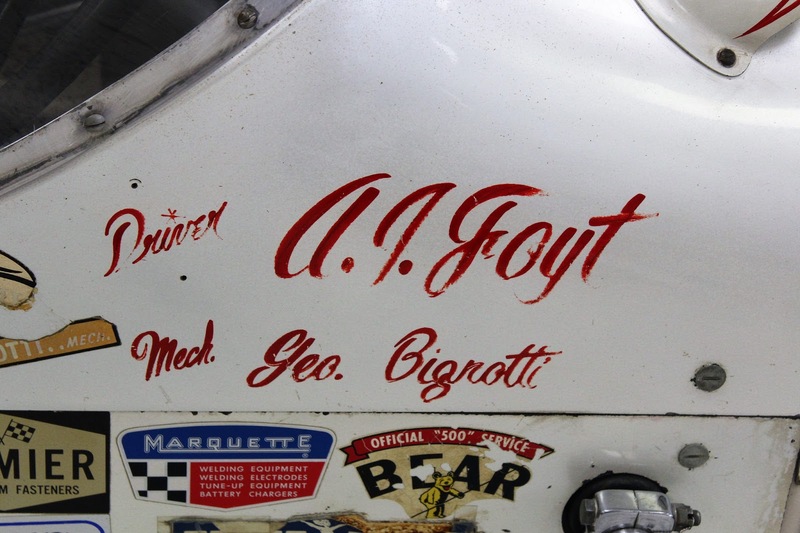 From the early days of simple paintwork came the era of commercialization, with cars named after their sponsors. 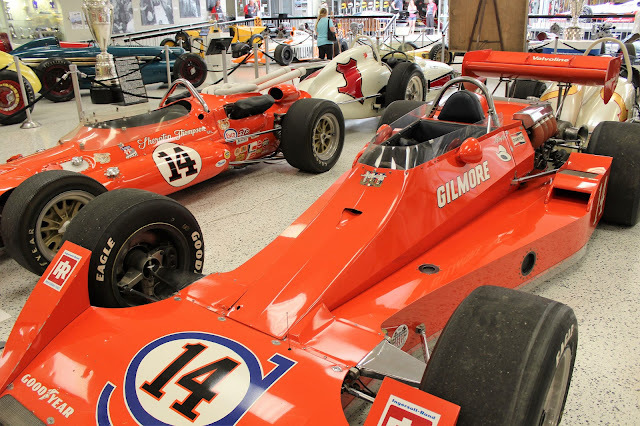 In an annex to the main museum were to found a number of interesting cars that did not win the Indianapolis 500 but nonetheless were notable. 1905 Premier ordered by Carl Fisher, one of the founders of the Indianapolis Speedway. 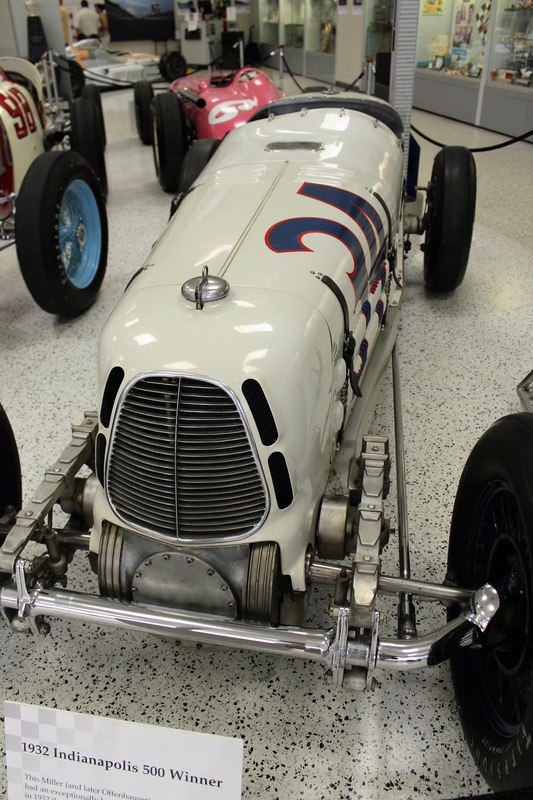 Massively overweight, this intended race car was still uncompetitive even when the body was removed! 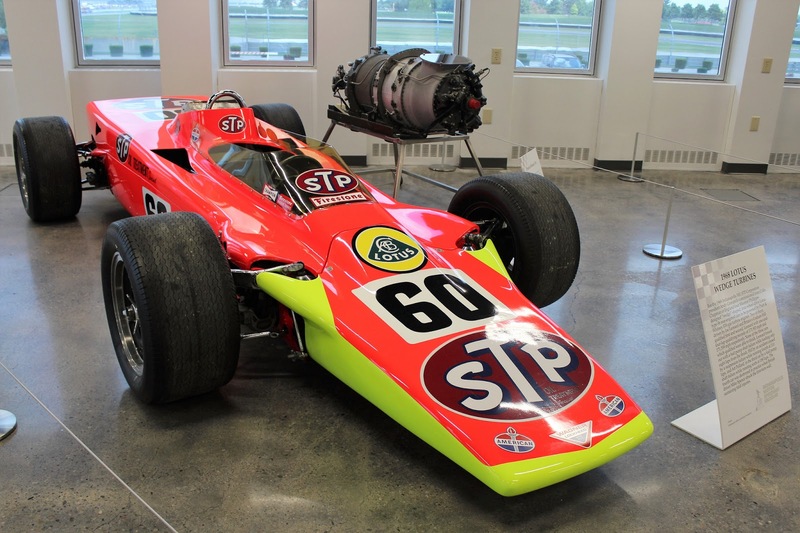 1968 Lotus 56 Turbine Wedge Car: four Lotuses were built using Pratt & Whitney Canada ST6 turbine engines and three ran in the Indianapolis 500 in 1968, with one car leading with only a few laps to go when it broke down. Highly innovative with its jet powerplant and four wheel drive, the Lotus 56 was subsequently banned when the USAC invoked new rules banning turbine cars. 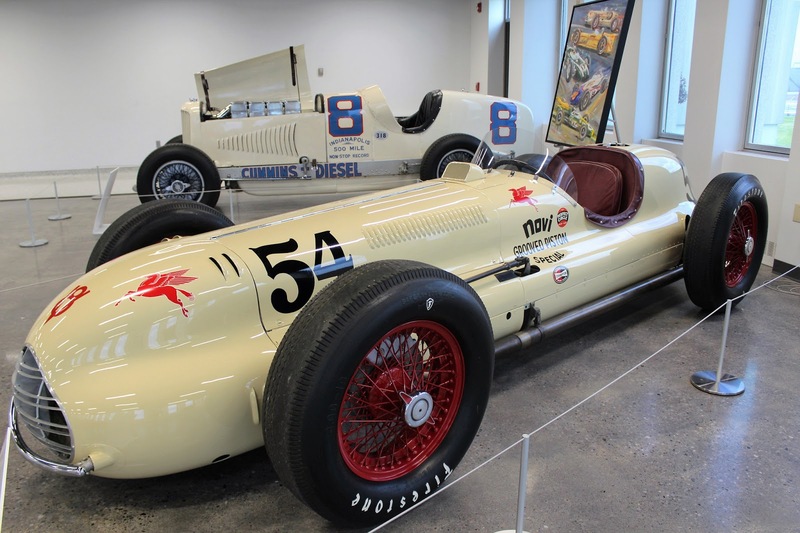 Much loved by fans for their size and noise, the supercharged V-8-powered Novi racing cars were present from 1941 to 1966, always qualifying well and often leading the race before something went wrong. A Novi's best finish was in 1948 when one came in third place. 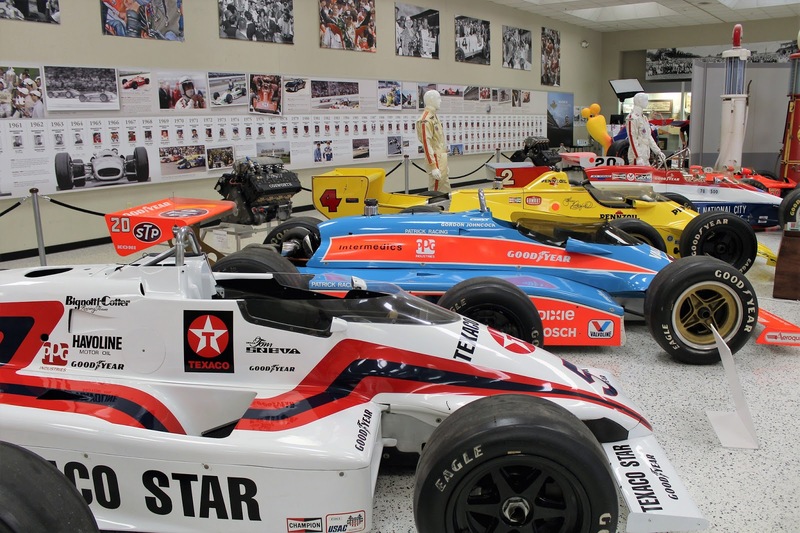 The final stop on our museum tour was near the lobby/gift shop, where a revolving display area hosts other kinds of race cars. 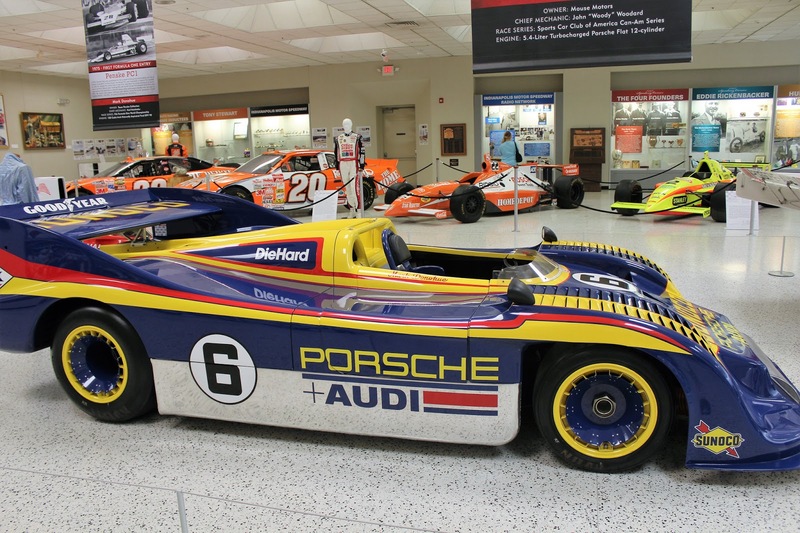 There were a number of entries from the famous Penske stable, including American muscle cars from the Trans Am Series, the monster Porsche 917 that dominated the thrilling CanAm races, NASCAR stock cars and other vehicles. 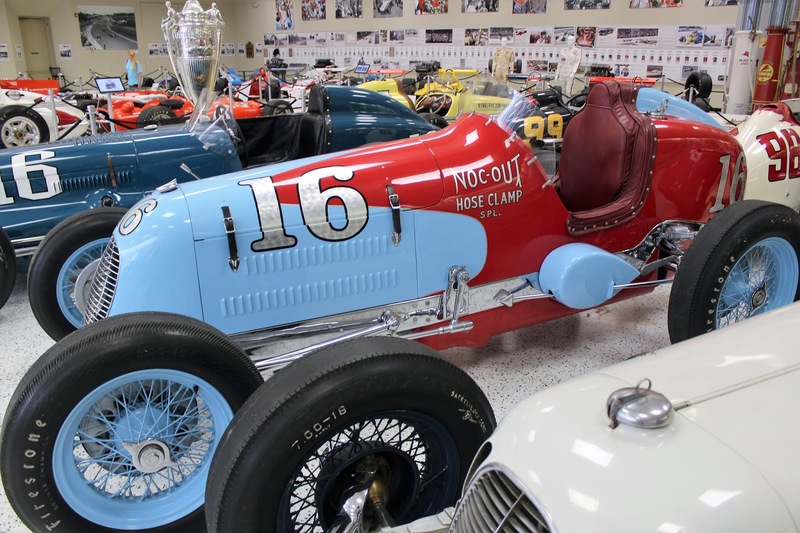 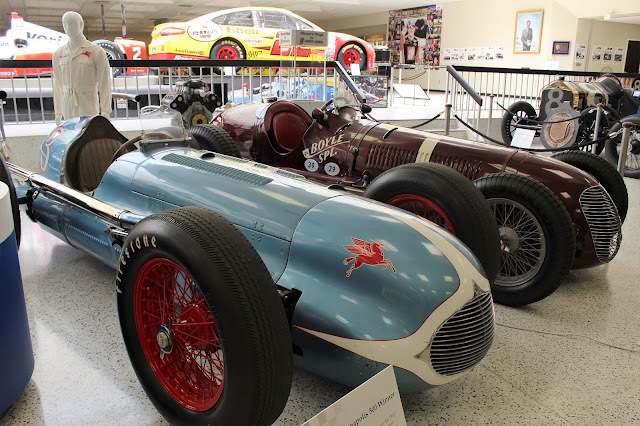 The Indianapolis Motor Speedway Museum has an excellent collection of cars, as you can see, but is somewhat limited when it comes to telling the story of the Speedway itself. It would have been nice to see more of an interpretive nature to take it from a quasi-warehouse of cars to a true museum but nonetheless we enjoyed our time there. 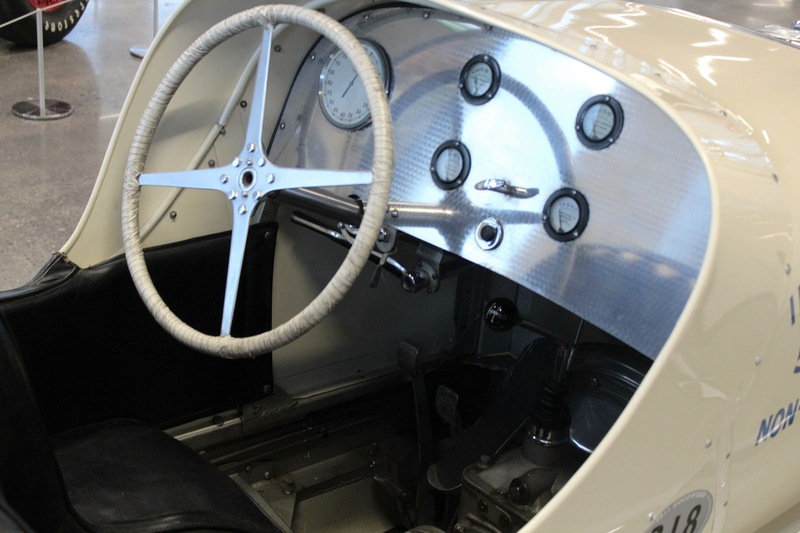 It should be noted that from time to time some of the cars are taken out for exhibition purposes and driven. 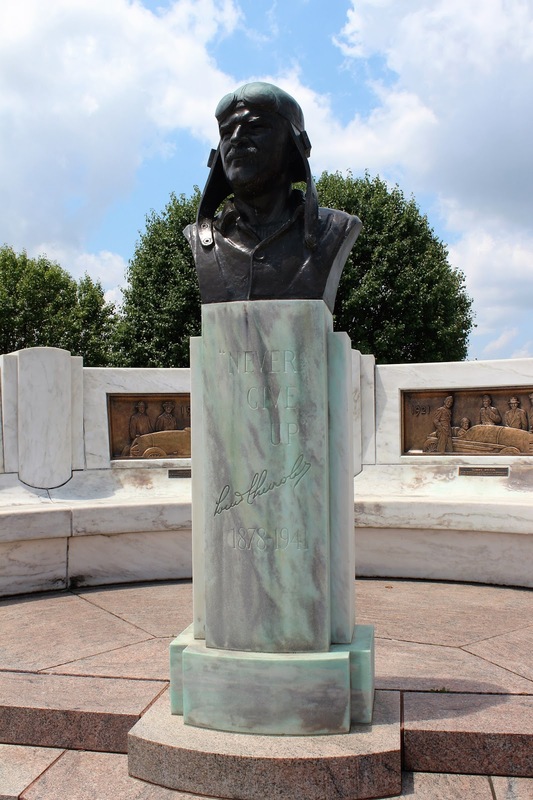 Outside the museum is this monument in memory of automotive pioneer Louis Chevrolet (1878-1941), who participated in the Indianapolis 500 four times, with best result being a 7th place finish. His brothers Arthur and Gaston also raced and Gaston won the 500 in 1920.